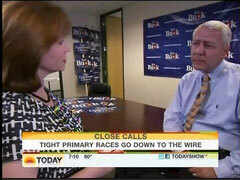 KELLY O'DONNELL: Winning on the Republican side - career prosecutor Ken Buck who had said this on the trail. KEN BUCK: Why should you vote for me? Because I do not wear high heels. O'DONNELL: Former Lieutenant Governor Jane Norton was the establishment choice, but the Tea Party picked Buck. Do you think of yourself as a Tea Party candidate? BUCK: I think of myself as a grassroots candidate and the Tea Parties are certainly part of that grassroots effort. O'Donnell never gave Buck the chance to explain to the country that his comment/joke came in response to Norton criticism of his candidacy, as he told CBS News' Bob Orr: "My opponent has said a number of times on the campaign trail that people should vote for her because she wears high heels, because she wears a skirt, because she's a woman...She ran a commercial that said Ken Buck should be man enough to do X, Y, and Z...I made a statement, it was a lighthearted statement that I'm man enough, I don't wear high heels and I have cowboy boots on." By not airing Buck's clarification and pointing out that the "Tea Party picked Buck," O'Donnell left Today viewers with the impression that Tea Party voters had just favored the sexist candidate in the race. In contrast Buck's Democratic opponent in the fall got a full interview segment to make his case to Colorado voters. ANN CURRY: Washington has been keeping an especially close eye on the primary results in Colorado. As we mentioned Democratic Senator Michael Bennet, who had the backing of President Obama, won his party's primary while setting up a November showdown with Tea Party backed Republican Ken Buck. We've got Senator Bennet this morning, joining us this morning. Hello Senator, good morning, and congratulations. SEN. MICHAEL BENNET: Good morning. Thank you. Thanks for having me today. CURRY: You know, your race fueled this idea that President Obama might not be such an asset on the campaign trail as it, as he was two years ago. Now, this morning after your victory, and it looks like you won pretty handily in looking at the numbers with 100 percent of precincts reporting, you, you won more than a 54 percent of the vote. What do you want to say about President Obama as his, in terms of his being an asset on the campaign trail? BENNET: You know, I'm very pleased to have had his support but I don't think it made the difference in the primary and won't make the difference in the general. The content of what I hear in my town hall meetings has never been further away from what we're hearing on our television sets than it is today. People are focused on how we get out of the most savage economy since the Great Depression. And I think, you know, the politics in Washington and the, and the political conversation we're hearing on TV these days is not particularly responsive to that and, and we have spoken to that and I think that's why we were successful in the primary and will be in the general. CURRY: Well so if you're saying that it wasn't necessarily what put you over the top, was it, would you have considered it a hindrance? I mean how would you describe the usefulness of President Obama being with you on the campaign trail, in some part, to your campaign? BENNET: I certainly wouldn't describe it as a hindrance and I also don't think it made the difference. I don't think it was material to most primary voters. CURRY: Right. In your victory speech, to the point you were making earlier, you said that, quote, "Washington has a lot to learn from Colorado." Exactly what do you mean by that, Senator? BENNET: Look we, even before we were in the worst recession since the Great Depression, if you look at the last period of economic growth, it's the first time in our history that our economy grew and middle class income fell. That's never happened before. So families in Colorado are earning $1,000 less at the end of the decade than they were at the beginning. The cost of health insurance has gone up by 97 percent. Their cost of higher education has gone up by over 50 percent. People are struggling to figure out how to make sure that we're not the first generation of Americans to leave less opportunity, not more, to our kids and our grandkids. That's what people in Colorado are focused on. CURRY: Well alright. I think we're gonna have to leave that as the last word. There will be a lot of questions, more to come as I'm sure you face this general election. Senator Michael Bennet, thank you so much this morning. BENNET: Thank you. Thanks, thanks for not asking me any wrestling questions. CURRY: Okay. You bet. You can count on that.